In other words — radio. Facebook has something brand new for the kids! It’s called Live Audio, and it’s… The radio. Only on Facebook. 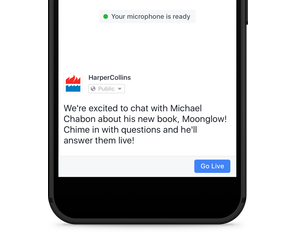 The social giant has partnered (read: probably paid) with several media outlets and authors in the Live Audio rollout. Initial partners include BBC , LBC, Harper Collins, and the authors Adam Grant and Brit Bennett.